Patrick and Rob DiCristino rub the lotion on their skin or else they get the hose again. Yeahhhh, thats what I meant by it. I may have been a few beers deep. Haha it's all good, drunken reviews are the best. Thanks for another great podcast! You have convinced me to watch Hanniable. I didn't love the first time around because I had a bratty teen moment, where it wasn't the thing I had loved. But I am not a bratty teen any more and am looking forward to it. On the subject of the podcastathon, there are so many great people in the fthismovie community that I don't think it would even be a question whether people would donate every year. I do understand the hesitation to ask people for money though. I think one potential work around might be to offer up fthismovie merchandise as rewards for certain amounts of donations (like a PBS telethon or something). Obviously there are logistical headaches involved in keeping track of donations, orders, shipping (including international shipping), and whatever legal stuff is involved, so that might not be feasible, but there's probably some workable alternatives out there. Totally by coincidence, I also watched The Omen for the first time this year! Unlike you two, it really worked for me, and the reasons I felt it did were the same specific things Patrick mentioned as working (the music, th-e high/low culture contrast, the religious baggage,) but not being enough to sell him on it! And I also have recently been eyeballing the Amityville franchise specifically because of the buzz I've heard about the sequels (especially part 2;) but I have already seen the original. 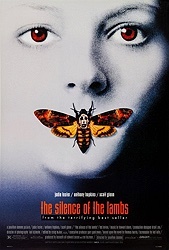 Re: the 'horror or not' question on Silence of the Lambs, I never felt it was horrific enough to count as horror; I completely agree that snobbier movie fans have always wished it wasn't so that they didn't have to treat it like a guilty pleasure, but I also always felt that the thrillerishness/procedural personality of the subject matter and it not being 'down and dirty' enough were keeping it from being genuine horror. I guess I'm just being a reverse-snob, and trying to keep myself separated from the academics. I do think elitist film fans should be embarrassed to like it though, because it's indisputably part of the Beach Read Adaptation family. I always thought the lecter escape scene was about really showing how powerful lecter is. In the film he's the one character who is NOT trying to change himself, he is 100% himself and has no doubts, and in practice that is horrifying. He is the insanity and violence of an unshakable ego. Cough-cough!...Trump. Patrick! You got Shadow of a Doubt without too much delay this time! Yeah, so I was listening to an old episode where you couldn't remember the name of it and, hey, for some reason I can never get the name very quickly. It was quite familiar. Where's Robbins? I could use some comfort food? Way off topic since I haven't listened to this podcast yet, but I have a request. Sometimes Patrick does a commentary article about the inside politics of movie fandom (such as the Wonder Woman one) and I am hoping he'll do one about Devin Faraci as a whole. There are many F This Movie podcasts where Faraci was name dropped several times by almost everyone working on this page, where Patrick almost changed the name of this site because Faraci changed his, where his outlook on various movies inspired those on this page. Listening to F This Movie for years made me check out Faraci's writing, and while yes, he was talented, I became quickly appalled by his social media presence and other aspects of his personality. One time I spoke about it online, merely as a curiosity. Faraci then took screenshots of my office TV from one of my video podcasts and made fun of it on Twitter repeatedly because it was 480p. How else am I supposed to watch my Laserdiscs? No one on F This Movie remotely conducted themselves online like Faraci did so I was always perplexed why he was such a role model for many on here. These recent charges against him are horrible, terrible, sad but fortunately they were strong enough that his constant verbal, mental abuse (to several males/females/LGBTQ) are now exposed into the mainstream. I have never presented myself as a fan of his online behavior. I have been a fan of his writing because I think it's very good. I don't think being a fan of his writing necessitates a comment on these developments except to say that it's ugly all over. I feel bad for the victims and angry at everyone else, including the perpetrators and the many, many people online who are using this as some sort of victory because they had an ax to grind. The whole thing is toxic and that's all I will say. If this was about anyone else, Faraci would be basking in the glory of that person's fall. He led by example and just like when any dictatorship unravels, other people that were harassed or stepped on will naturally rise up to help demolish the legacy. It just goes with the territory, I suppose. In my personal opinion, I feel his vitriol and toxicity expressed online undermined the often good points he made in his writing--and that sadly affected my thinking of him. And sometimes it was the old adage, "Not what you say but how you say it." I only bring any of this up because I know how influential he was to many of you on the site and was curious how you all differentiated between the man's work and the man himself--especially now. I honestly know very few people who even know the name of Devin Faraci so it's nice to be able to air out my thoughts to other people I respect in the film community. This was mentioned on the podcast in a similar way, but I'm always surprised at how parts of the movie seem to have different lengths every time I watch it. I think that speaks to how many different ways you can view things in this movie, but I notice that every time. I'll watch it and the basement climax seems to happen really quickly, or different scenes of the investigation appear to take longer. It's odd but it keeps things fresh in a way. "I'm gonna eat your brains and gain your knowledge"
Dennis, I say that phrase weekly. It's one of my favorite things in a movie EVER. and the fact that it sounds like intentional ADR (which is very may have well been) makes it's even better. "I went looking for answers but came away with more questions"
I always took the character as a victim of severe homophobia...that his upbringing (and society) made that something SO horrible to be for him that he will destroy himself and ultimately others. He would rather believe that his attraction to men means that he is actually in the wrong body and change that. The psychologists recognized that this is the wrong decision for him but he still can't accept this and it drives him to do what he does. I saw it as recognition of what damage the concentrated hate of society toward homosexuality can do to a person's psyche and self worth. And while I agree with the LGBT community hating that they're usually cast as the villains or the sad damaged characters I'm sorry that this film took the brunt of that. I don't think it deserved all of that. In 1991, it was this film and JFK that was attacked by the LGBTQ community. However the zenith would not be reached until the following year with "Basic Instinct". Ding ding a ding...good job Kathy. I think you're spot on and put in words how I've always thought about Bill. Can't wait to listen to this at work tonight! I just recently picked up the blu-ray on the cheap, watched it and it was like watching it for the first time all over again. As mentioned in previous articles, the framing is fantastic, some of the best performances ever put on film as well. Looking forward to hearing your thoughts! One reason that we like Lecter so much, and Ebert points it out in his great movies review, is that he likes and respects Clarice as much as the audience does. He's not like the other sexist men, towering over her. And I think Hitchcocks saying of we like people that are good at their jobs applies to Lecter too. He doesn't have a job, per se, but he has a purpose. I think the sequence of Lecter showing us who he is and what he can do is very akin to Eastwood's character from Unforgiven, which came th next year. The whole movie we hear about how "bad" he can be, and when it finally gets to that moment, boy does it deliver. I think both of these sequences are what solidified their best picture wins. My favorite sequence in Lambs is the intercutting between the two houses, when they (& us) realize it's the wrong house. What great thrillers are made of. comparing this to manhunter is a bit unfair to either movie, but it is still impossible not to do for those who've seen both. i prefer manhunter because i prefer that it is about the chase and not the relationship between hannibal and clarice. and i prefer brian cox portrayal. No lie at all; I love STOKER and it was my #1 movie for that year. It's such a fantastic coming-of-age gothic romance terror. In response to Patrick's question about Anthony Hopkins' performance, I wanted to share a quick story. I was a theatre major in college in 1991. About two weeks after the movie's release, I had an acting professor dedicate an entire class period to "How did Anthony Hopkins DO that?" In essence, how do you make something so terrifying when we know (or, at least, hope) that he can't get out of that cell? There was lots of discussion about stillness/restraint vs. ranting and raving, and, of course, the age-old question of whether it's what Hopkins is DOING vs. how Jodie Foster is reacting to it, etc. Anyway... To put this in some sort of perspective: in four years of undergraduate work, and three years at an MFA conservatory, I never heard another specific performance talked about or analyzed in the same way. One interpretation of lector's escape is that it was a price paid for his help. A deal with the devil. Was hopkins' performance hammy? Maybe a little but it's skillful ham that not many could do. Is lambs horror? Partly. The bigger question is why do we have to limit films to one genre? I could say saving private Ryan is a horror movie because the beach scene is horrific. To say "oh it's a war movie" causes you to be desensitized to the horror and limit your view of what's happening. Excellent show. Rob was a great cohost too. You guys definitely did the film justice. Brilliant show, I really loved it. This is my favourite horror movie too Rob; also, Clarice, in this film, is my favourite movie character! And it is also in my top five movies in general. I find it a little surprising you didn't really talk about Jodie Foster's performance, given the fact you discussed Clarice to great lengths. I think your discussion of that character is very eloquent, so it is not a criticism as I know it is hard to cover all bases! But I would like to know what are both your takes? Personally, it is one of my favourite performances in a movie. very high cultivation standards for a top shelf excellent product. Though we differ on the issue of dispensaries and their existence, these folks are part of the conversation and need to be held to as high standards as Nathan guarantees his facility operates under.